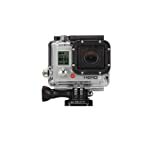 Amazon has the gopro HERO3: white edition - (197'/ 60m waterproof housing) for $223 with free shipping. Sells for $279+ Highest Price. Deals for $185 Lowest Price. Normally $239+.